Get to know Why do birds migrate. Some of the most amazing and interesting Bird Migration Facts for kids. Bird migration facts are very interesting and amazing. School children mostly inquire about them during their science class. It was for this reason that I have listed down some interesting bird migration facts for those who are curious about this unique seasonal trend of birds. Bird migration is defined as the movement of the birds with the change of season from one area to another area for breeding purposes. The decrease in food supply caused due to the change in season forces the birds to migrate to a place where there is ample supply of food. The second reason for migration is reproduction i.e. to move into a specific location with warm temperature to raise young in breeding season. Birds prepare themselves for this long journey by eating more food. This food is stored in the form of fats in their body. Some birds eat as much as that their mass increase by two folds. An interested example is that of the ruby-throated hummingbird which stores enough fat to energize its 600 miles – 24 hour non-stop flight over the open water that originates form U.S. Gulf coast and ends in the Yucatan Peninsula of Mexico! Birds that feed on insects, such as Swallows and Swifts migrate during the day time so that they can feed on insects on the way as they migrate. 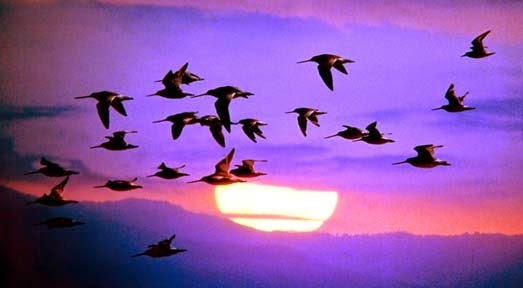 Birds that fly in flocks such as finches and waterfowl also migrate during the day time. · Songbirds are known to be night time migrators. They rest and eat during the day at stop places. They fly at night because of still air and low temperature. How Far is Bird Migration? How far the birds migrate, it depends upon their species. Some migrate over very long distances while some migrate with making stops at several places. Here are some amazing bird migration facts about the distance of migration. · The longest distance of bird migration is covered by the artic tern which is about 18,600 miles ranging from arctic to Antarctic.The bird feed on fish during the long journey from the top to bottom of the earth and vice versa. · Some species migrate by very low distance in search of food such as seeds, insects and berries. · Songbirds migrate with several stops on the way called staging areas. Their stay at these areas varies mainly depending upon the weather conditions and fat stored. Some stay for weeks while some may continue their journey after a day rest. The flight altitudes vary depending upon the flow of wind. Birds tend to fly low when flying against the direction of the wind and they fly high when flying along the direction of the wind. · Migrating ducks and geese fly with very high altitude with Bar-headed geese having the record of 29,000 feet when it migrates over the Himalayas mountain range. · Night time migrators usually fly below 2000 feet over land, however, they may rise to a height of 6,500 feet in case of favorable winds. · Shorebirds’ flight speed varies from 30 to 50 miles per hour. · Songbirds’ flight speed varies from 20 to 30 miles per hours. The flight speed may be more in case of favorable winds. · Birds are equipped with amazing sensory organs which help them accurately navigate their path during the migration. Their exceptional vision helps them to identify visual landmarks when migrating at long distance. These landmarks include mountains, coasts and rivers. They can also sense their way through the direction of the sun, stars and earth’s magnetic field.